Learn about the advantages of using acrylic paints in your creative repertoire. (Robert used oils for years and never looked back after he started using acrylics.) During this two day class students will learn all they need to know about working with acrylic paints to capture brilliant and subtle colors and a achieve a variety of textures. The class is open to students at all skill levels. Among the topics covered will be; color mixing, adding additives to make the paints thicker or thinner, slowing drying time, using acrylics as washes, sculpting with acrylics, brushstrokes for creating various effects, using fast drying time to your advantage, and how to control blending colors. We will also talk about composing your picture, stretching canvases, transferring drawings to canvas, various surfaces to paint on, as well as some useful hints on drawing, shading and shadows, and creating the illusion of depth on a flat surface. A materials list will be provided to students prior to the class. (NOTE: SPA has a good supply of acrylic paints that you are welcome to use – let us know if you are interested in this.) Bring 1-3 photographs from which you would enjoy working (or a still life arrangement). There will be light “practice homework” suggested for the week between the 2 workshop sessions. If you have any questions, feel free to email Robert Waldo Brunelle, Jr., at brunelles3@aol.com. Visit his website at www.mrbrunelle.com to see examples of his acrylic paintings. 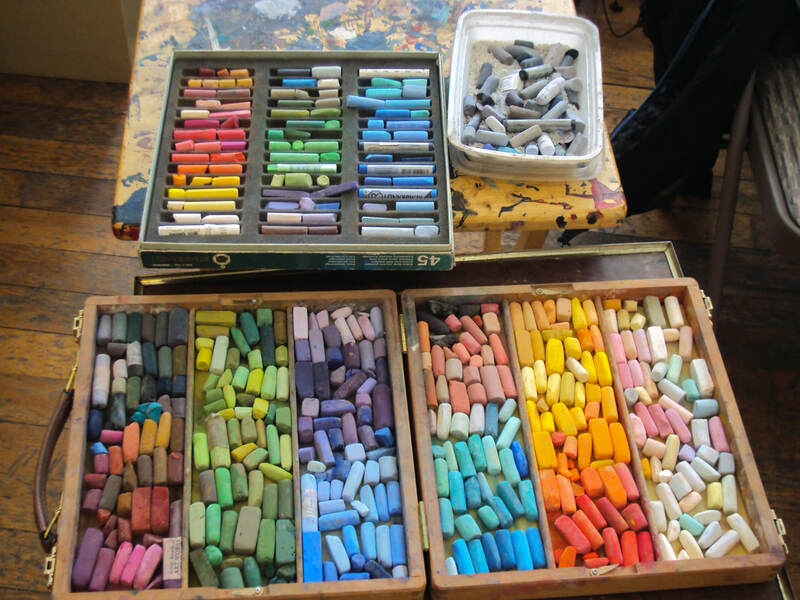 This class is appropriate for all levels of students working in pastels or oil paints. It’s a wonderful workshop for people building their skills in both media. Each session will begin with Jeneane providing a short demonstration. Learn and practice the fundamentals of drawing, design, composition, light and color and how to put it all together. Critique and coaching will be individual. Participants will do still life and work from photographs. Contact SPA for a suggested materials list for this class; please let SPA know which medium you will be using. If you already have oil paints and other materials, the instructor asks that you bring odorless paint thinner for this class. Jeneane Lunn attended the Art Students League of New York. She has been an artist and teacher in Vermont for the last twenty five years. She has participated in many national and local art exhibitions including the Pastel Society of America, National Arts Club, NYC, Salmagundi Club, NYC, Pen and Brush Club, NYC, St. John the Divine Cathedral, NYC, Shelburne Farms Exhibition, Shelburne, Vermont, and Frog Hollow Vermont State Art Center to name a few. She has created posters for Vermont Symphony and T-shirts for Farm-aid, a national organization to help farmers started by Willie Nelson. These two elements, pattern and color, have huge potential to make a work of art rewarding to make and to look at. In this class, we’ll do some serious play with color, theory and practice, and of pattern in nature and in art. Subject matter will range from still life and interiors to pure abstraction. We’ll work in pencil, transparent watercolor, and gouache. Materials fee to the instructor: $5 or $15 (please see the materials list). 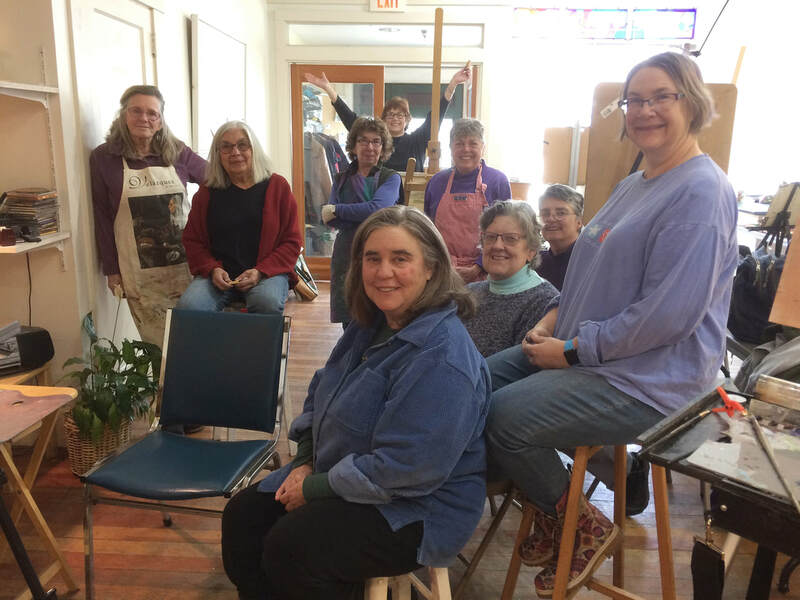 Susan Sawyer is an artist-naturalist from South Woodbury with many years of experience teaching, mostly adults in college and non-formal settings. After starting life as a printmaker and decades of making art quilts, her current practice consists of drawing, painting, and biological illustration, in graphite, ink, watercolor, and silverpoint. She believes in an experimental and experiential approach to all kinds of education, as well as careful observation of worlds without and within. Upon approaching your canvas or paper, have you considered what you want to say? Practice how to find a fresh purpose and vision for creating your art and ways to express yourself in this flexible, informal workshop with Nitya. There will be two focal points for the workshop. During the morning (concluding at 12:30PM), participants will pursue their particular interests and find their creative focus by painting or drawing a sculpture or still life. During the afternoon (starting at 1PM), participants will work from a partially clothed model with several poses. All media are welcome; knowledge of handling the medium with which you are working is needed. Easels are provided at SPA (and in some cases, we have extra art media, such as pastels and acrylic paints.) Bring a snack or lunch; there will be a brief break from 12:30-1PM. Join us for an Artist Talk with Hannah Morris, who will discuss the body of work created for the SPA exhibit in early spring of 2018. Titling her exhibit "The Feast of Fools", Morris featured painted collages and soft sculpture installations that explored the intersection of the sublime, the absurd, and the mundane in recognizable moments and places. In this artist talk, she will present the work from the exhibition and offer insight into her process and inspiration. Please bring a snack or lunch; a selection of hot tea is available. Hannah Morris is a visual artist in Barre, Vt. She uses gouache, collage, pen & ink and fabric to make thoughtful, lively, and whimsical paintings and soft sculpture installations. During her residency at SPA, Hannah created a body of work called, "The Feast of Fools," a show of painted collages and soft sculpture installations. Hannah attended Bates College in Maine and completed her graduate program in visual arts at Stellenbosch University in South Africa. Have you ever thought to yourself, "I could do that!" when looking at a work of abstract art in a museum or gallery? Or maybe you’ve wondered why collectors would pay millions for artworks that seem simplistic, bizarre, or just plain ugly? It is sometimes tempting to think that art is just "in the eye of the beholder." But, by imagining art history as an ongoing conversation, Champlain College Professor David Mills explores ways of encountering art as more than just subjective preference. This highly visual presentation provides new ways to interact with what we find in museums and galleries. A collaboration with the Vermont Humanities Council. David Mills is a Professor of Interdisciplinary Studies in the Core Division at Champlain College. He earned a Ph.D. in Philosophy from the Pennsylvania State University, with a specialization in philosophy of art. He has been teaching interdisciplinary undergraduate courses in philosophy and aesthetics for over 20 years, and his published research focuses on European philosophy and art after the world wars. This is a creative skills class that will take you through the process of planning and executing a knitting project without a pattern. Each student will knit an accessory of their own design using a variety of yarns and techniques that are put together in a non-traditional, artistic manner. Students for this class can be beginning knitters, but should be able to cast on, knit, purl, bind off and be willing to experiment. Materials: Medium weight/worsted weight yarn in a variety of colors (at least 3 colors, approximately 300 yards total), knitting needles size 7 or 8 (straight or circular), DPN’s size 7 or 8, crochet hook size G or H, yarn needle, scissors. The instructor will bring some additional yarn to supplement. There will be a $5 materials fee to the instructor. Leslie Roth is a sculptural artist and published knitwear designer with more than a decade of teaching experience. Interest in cold wax medium has gown a lot recently. Not only among oil painters, but also collage artists, print makers and even sculptors. It offers unique qualities for layering, translucency and added body. This workshop will explore the use of cold wax medium combined with oil paint. The use of cold wax medium lends itself to a process driven approach for creating works that evolve intuitively with little or no planning. We will explore the use of color and different techniques to create expressive paintings using tools such as palette knives, brayers, squeegees, fingers etc. Participants will also have the option of the addition of collage and other materials as a further means of expression. Some materials will be provided for a fee to the instructor of $30. A list of suggested materials to bring to the workshop will also be provided. Larry Bowling studied painting at the University Of Arkansas and School Of The Museum Of Fine Arts Boston. He has had solo exhibitions at The Cambridge Art Association, Cambridge MA, The Alexey von Schlippe Gallery at the University Of Connecticut, and The Stove Factory Gallery in Boston MA, as well as group exhibitions at Bunker Hill Community College, Charlestown MA, and galleries throughout New England. He makes art through painting, collage, assemblage, cold wax and encaustic. If this winter is giving you the blues, here's a reason to like it a bit more - book artist Hedi Kyle's famous Blizzard Book was invented during a snowstorm! This gem of a book has a spine made of folded pockets that lock pages into place without using adhesive. The folded components can be modified to create other structures that Hedi affectionately refers to as the Blizzard Clan. In this workshop, you'll start by making the book that started it all, the Blizzard Book. As time allows, you'll complete up to five variations including the Blizzard Box, the Blizzard Pocket, and the amazing Wheel of Fortune. All of these structures are intended to house your choice of content - for example, business cards, ticket stubs, or fortune cookie fortunes. You'll leave this workshop with a completed set of books and a basic knowledge of folding and bookbinding technique. You will receive a detailed handout and resource list for all materials we use. Experience in origami is helpful, but not required. Supplies: Awl, bone folder, metal ruler, X-Acto knife, cutting mat, scissors, pencil, glue stick or roller adhesive. NOTE: Bring the supplies if you have them – don’t feel obligated to buy anything. Elissa will have extras available. Elissa Campbell has been making books for the past 23 years and sells her work professionally under the business name of Blue Roof Designs. She is a big believer in the power of using books for self-expression. Elissa is currently serving on the boards of the Book Arts Guild of Vermont and the Vermont Crafts Council. In this one-day class students will learn the basics of drawing: How to use 1-point and 2-point perspective techniques to create the illusion of depth on a flat surface, how to use shadows and shading to create dimensional effects and textured surfaces, how to compose a drawing to maximize viewer interest, how to create movement in a drawing, how to correctly draw the human face and figure, and how to exaggerate those faces and figures to create caricatures or cartoons. A materials list will be provided to students prior to the class. If you have any questions, feel free to email Robert Waldo Brunelle Jr at brunelles3@aol.com. Comprehensive handout provided. Birds are wonderful subjects! Live birds in all their myriad poses present some unique challenges. Because they are in constant motion and may fly away before you can even get your pencil out, we’ll use all the possible resources to build familiarity and skills, from photographs and video to feathers, bones, nests, and other artifacts. Materials to bring: Drawing paper, pencil, and pen. Hone your observational skills and practice drawing techniques while rendering a still life composition in white and black charcoal on toned paper. In this one day workshop, we’ll explore the use of contrast and value change in creating dramatic drawings. Basic shading and contour drawing skills will be covered and students will learn how to use value effectively to give the illusion of light and shadow in creating three-dimensionality. Some drawing experience is helpful but not necessary. Materials fee to the instructor: $10. Meg Miller is an artist and educator who lives and works in her home and studio in Williston VT. After receiving a BFA from the Rhode Island School of Design, she earned her Art Education certification from the University of Vermont and spent many years as a passionate public school art educator. In 2011, she received the Vermont Art Educator of the Year award. Now retired from public school teaching, Meg continues her work in drawing and painting; showing in local galleries and shops. She also teaches adult drawing classes throughout the year, enjoying the opportunity to again connect with students and share her love of drawing. Consider this workshop the equivalent of a Closure Dressy Bessy. First you’ll complete a soft cover, leather book using a variation of the long stitch binding. Then comes the fun part – you’ll experiment with a variety of ways to secure those books. You’ll explore ways to use sticks, buttons, leather straps, and metal hardware to create up to 5 closures per book (as time allows). Bring your own embellishments (buttons, ribbons, etc.) that you’d like to use for closures – there will be time for discussion and problem-solving as a group. You’ll leave this workshop with one book measuring 9.5″ x 6.5″, along with a detailed handout and resource list for all materials used. Materials/Equipment: Bone folder, scissors, X-Acto knife and extra blades, 24″ metal ruler, awl, cutting mat, pencil, a minimum of two sewing needles, Japanese screw punch (or equivalent) with assorted bits (1.0 – 5.0), small glue brush (0.5″ – 1″), small metal triangle. Bring the supplies if you have them – don’t feel obligated to buy anything. Elissa will have extras available. NOTE: The first Find Closure workshop is not a prerequisite for taking this one. Everyone is welcome! This fun, educational and challenging workshop provides discussion and demonstrations emphasizing the visual, intellectual and technical concepts underlying the "Quick Sketches” of French Impressionist painting. Qualities include quick-pace expression, simplification, limited palette color, ground color, and more; work from your photos of any subject -- landscape, still life, interiors etc. All levels welcome. For the beginner, this class teaches the basics of stained glass. Students will learn how to cut glass and how to assemble a stained glass window using the copper foil technique. They will then build a small panel from a design provided by the instructor that they will be able to take home with them. By the end of the class students will know all they need to in order to begin making stained glass pieces on their own. Materials fee to the instructor: $20. Chris Jeffrey has been working with glass for close to 30 years. His glass studio is now in South Hero but for 18 years he maintained a full-time studio at SPA, making stained glass windows for homes and public buildings throughout Vermont and beyond. Recent major commissions include a window for the Christ Episcopal church in Montpelier as well as a number of mausoleum windows for the Rock of Ages granite company. Chris has many years of experience teaching complete beginners how to make beautiful stained glass pieces. Join accomplished landscape painter Jeneane Lunn at beautiful central Vermont locations for plein air oil or pastel painting. 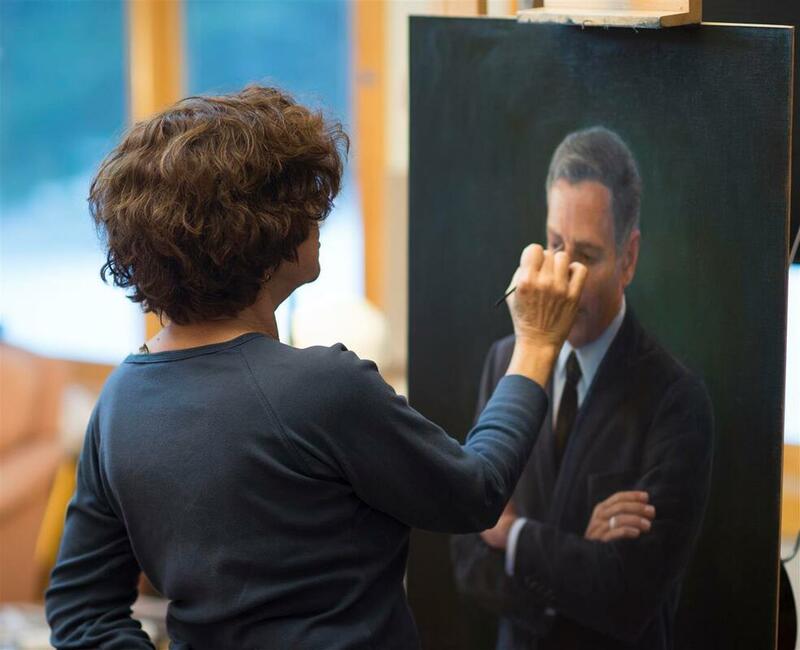 The sessions will focus on your process of beginning your painting, and how to keep it fresh. Contact SPA for a suggested materials list (SPA has some very portable easels that could be loaned for the session). For example, painters will need to bring hats, drawing board for pastels, bug spray, easels, something like a camp stool to put palette or pastels on, low chair if you want to sit and have pastels or paints on the ground, and a painting umbrella desired. +More classes and activities coming soon!